Kids Photo Camp - Triple Joys!!! I dropped by at the SM Manila during lunch time, and looked what I've seen! 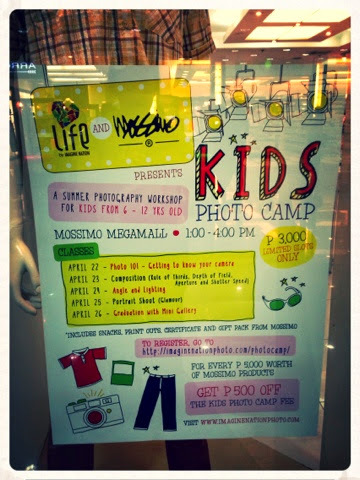 Life & Mossimo are offering a 5-day Summer Photography Workshop for kids 6-12 years of age at their SM Megamall branch starting on April 22 to April 26, from 1:00 to 4:00 in the afternoon. Hurry, register now as this workshop only has limited slots. Workshop fee is P3,000.00. To know more about this, visit Mossimo's page on Facebook. You may also check Life's website at www.imaginenationphoto.com !